By John C. Toman. Posted September 5, 2011, 9:22 AM. Monday morning brought measurable rain in many inland locations, as thunderstorms pushed west past the mountains overnight. 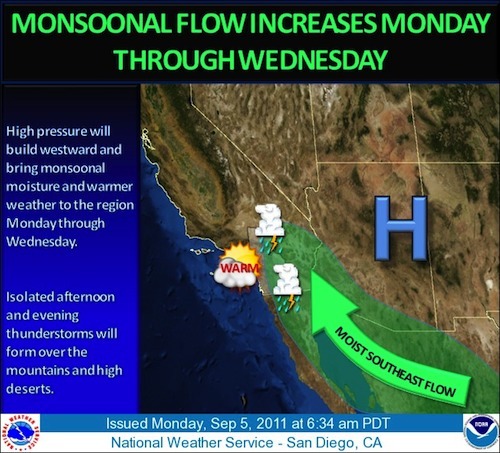 By mid-morning, clouds had spread across Southern California's inland valleys, and rain had fallen mainly in the southwest, in Lake Elsinore (0.04"), French Valley (0.04"), Murrieta (0.03"), De Luz (0.02"), Fallbrook (0.01") and Temecula (0.01"). Katy Parkhurst, of Sun City, talked about the morning rain. "Went out about 8am this morning to get the paper," she said. "The streets and sidewalks were quite wet." Thunderstorms were also active yesterday, but only Fallbrook received any measurable rainfall (0.02" in the 11am hour), with those clouds coming up from the south. The major activity, however, began yesterday evening. A low pressure trough off the coast was helping to pull the clouds and moisture westward across the region. Current predictions are for the best chance of rainfall this morning, falling off this afternoon and evening, then increasing again overnight tonight. Partly cloudy skies were expected to last across the region through tomorrow, with thunderstorms possible in the eastern inland valleys tomorrow, then limited to the mountains and deserts on Wednesday. Dry lightning was also possible, according to WeatherCurrents' meteorologist Jim Purpura. High fire danger was also forecast, despite the influx of humidity.